Universal Turf: Peter Manion is a mixed media installation of never-before-seen works by Saint Louis-based artist Peter Manion that explores social and interpersonal parallels between chess and humanity. 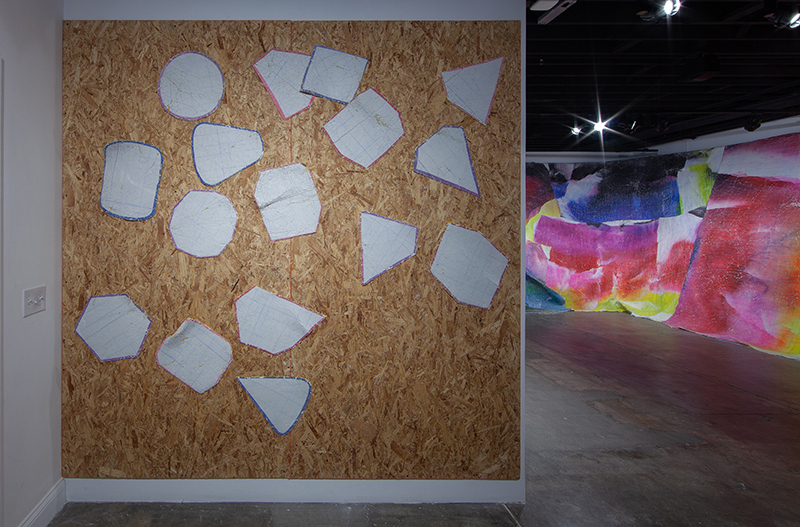 Manion’s plaster-coated panels of dyed felt create an interactive environment in which visitors are encouraged to interact with parts of the installation. On View: October 5, 2018 - April 14, 2019. I met Peter Manion about 10 years ago, soon after I moved to Saint Louis. I was always impressed with his artwork, his creativity, and his interest in experimenting with different media. Little did I know, that in addition to his proclivity for art, he also had a deep interest in chess. Peter came to the World Chess Hall of Fame (WCHOF) shortly after we opened in 2011 with an old, rugged-looking Milton Bradley chess “game.” This was no ordinary cardboard or wooden board with simple, cheap, plastic pieces—this was a machine! He carried the Milton Bradley Electronic Grand·Master, first sold in the early 1980s, up to our offices and still had the actual original cord. I stared in disbelief, not only surprised that something like this existed, but also that he could actually plug it in and it would still work. We found an outlet, he plugged it in and it came to life. The box claims that it “Moves its Own Pieces Automatically and Brilliantly!—for 1-or 2-players.” He set up the pieces and began pushing buttons that had looked like they had been pushed 1000 times before. Immediately, loud creaking noises came from within the machine and the chess pieces began shaking, stuttering, and moving across the chessboard. I was amazed by the mechanism, and as he smiled watching it work, I thought that Peter might be relieved to rid his home of this old toy, not realizing that years later we would be having a very emotional conversation about what that game meant to him as a child and later as an adult. In March 2017, the WCHOF opened the exhibition The Imagery of Chess: Saint Louis Artists. This was directly inspired by the groundbreaking 1944 exhibition, The Imagery of Chess at the Julien Levy Gallery in New York City. Organized by Marcel Duchamp, Julien Levy, and Max Ernst, the original show included the work of over 30 painters, photographers, sculptors, critics, and composers, among others and sought to challenge the accepted conventions of the ancient game. The highly-publicized exhibition was well received by the chess, art, and general communities, and the project went on to inspire artists over the last 70+ years to reinterpret the game in an artistic way and became the basis of the artistic programming at the WCHOF. Our contemporary exhibition featured 20 leading local artists, writers, designers, musicians, and composers and their newly-commissioned artwork and performances inspired by the game of chess. Not only did Peter exhibit in the show, he also assisted me with selecting several of the artists in the exhibition and added to its success. This new exhibition was so inspiring because it celebrated the impact of chess culture in Saint Louis and promoted local artistic talent. I knew immediately that the WCHOF needed to create more local artistic programming and exhibitions. Universal Turf: Peter Manion debuts this new wave of regional artist exhibitions at the World Chess Hall of Fame. With a mission to celebrate the history of the game, we strive to make everyone feel welcome here, whether you’re a grandmaster or you have never picked up a chess piece before. Universal Turf is not just an art exhibition, but rather it is an immersive environment that begs the viewer to engage with a series of sculptures and installations and become lost in an endless interpretation of the universe, of time, of space. 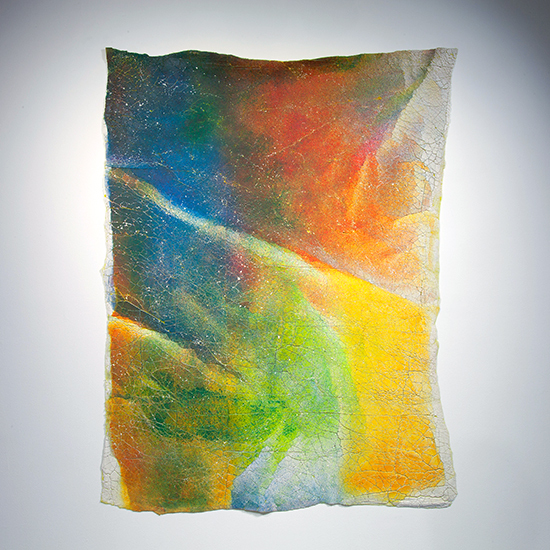 Peter doesn’t use typical artists’ supplies; rather, inspired by his earlier career as a house contractor, he uses thick felt, plaster, paint, and dyes to create movable, beat-up, crumpled, living pieces of art. Because he is constantly manipulating the pieces, they will never look the same twice—there are an infinite possible ways his work can be exhibited similar to the infinite possible moves in a chess game. “As the viewer enters the gallery, the first image is simple and appears to be a blank canvas. This is an exercise in nothingness. However, these works are about looking closer and studying, just as in a game of chess. Take a moment to let your imagination wander. 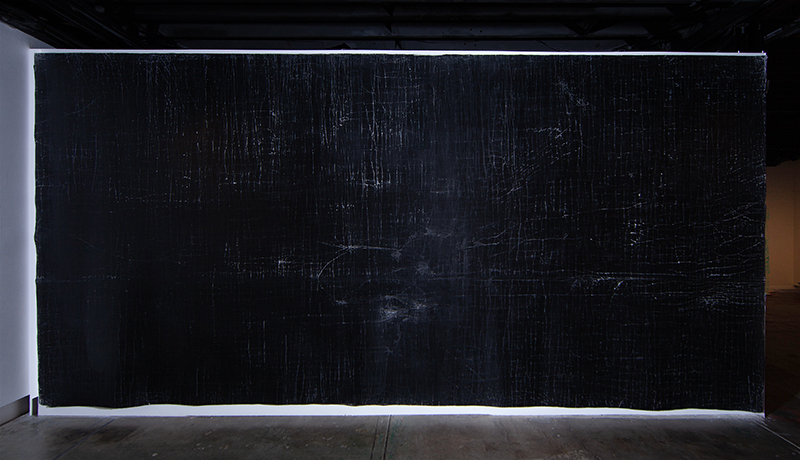 Composed of black plaster on black felt, this is the single largest piece I have ever made. 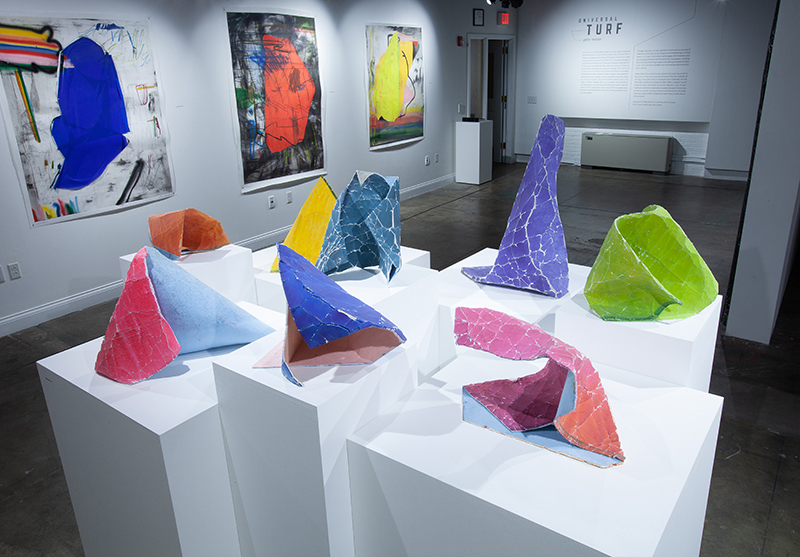 To the right, you are confronted with an array of small, colorful sculptures made of the same materials, but they are completely different in scale. Viewing these works you think, are they fixed sculptures? Solid or hollow? Heavy or lightweight? The surface texture gives the appearance of weight. Mixed media works on paper on the wall were created in a sketchbook approach. Forget the composition, the purpose, or logic—they are to show my thought process, working out ideas past and future. The shapes are semi-attached sheets of vinyl that can and may fall off. The primary colors are the basis for all of the colors we see. They are elemental colors. Opposite the sketches are human-scale, colorless works. 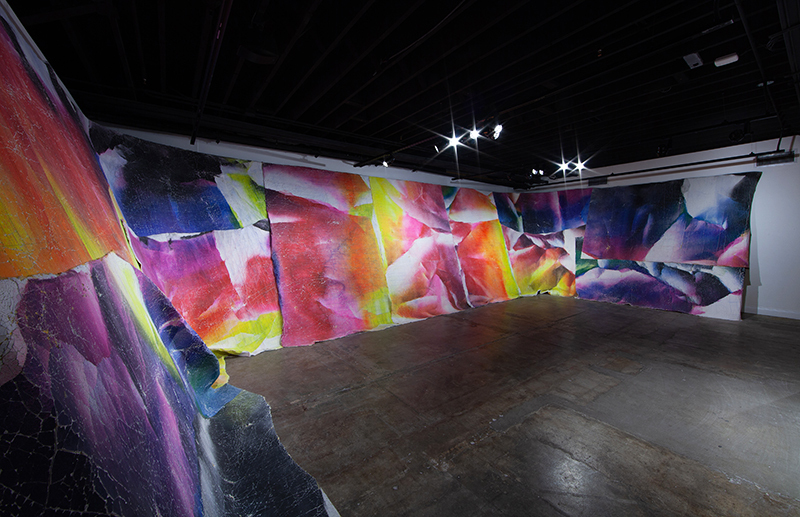 Composed of white plaster over colored felt, they are formed and pushed to create monumental, stiff sculptures. Though they appear immovable, they are in fact flexible and ready to fall from the slightest disturbance. These works exemplify the transformation from painting to sculpture and show that the works trigger more questions than answers. Though one may not see a perfect chessboard or an array of Staunton chess pieces, by studying and meditating on these works, our hope is that the viewers will engage with the pieces and possibly get a glimpse into the mind of a chess player—plotting future moves, reflecting on past ones, taking a moment to slow down and think and wonder if you are seeing what everyone else is seeing? Are you focusing on the big picture or the tiny details? Are you thinking before reacting? Are you moving automatically and brilliantly? Spend an hour in the studio with Peter Manion, and you’ll learn that it is an understatement to call his artistic practice process-driven. 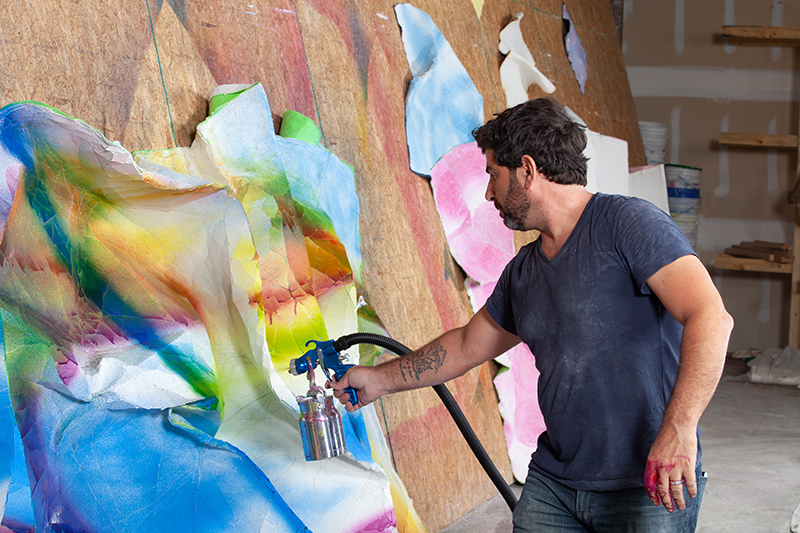 Plastering, spraying, moving, manipulating—ultimately creating—his sculptures are tests of endurance, patience, and learning to let go. Though his finished works appear to be thin and ephemeral, each piece can weigh as much as 100 pounds and requires the assistance of several people to carry. In the studio, Peter becomes one with his art. He crawls along the walls, climbs over and atop the pieces, jumps, and hurls the work when needed, working to create a proper balance of adhesion and protrusion. It is an example of action art at its finest. It’s mesmerizing and energizing. There’s a primal nature in how he utilizes his entire body to create. Peter works to coax the materials, but ultimately allows them to behave as they wish. In this, he could be called a facilitator, rather than a creator. This cycle—of energy of creation, transformation, and decay—is palpable. Within that hour of sitting in Peter’s studio, a piece so perfectly formed may fall without notice. 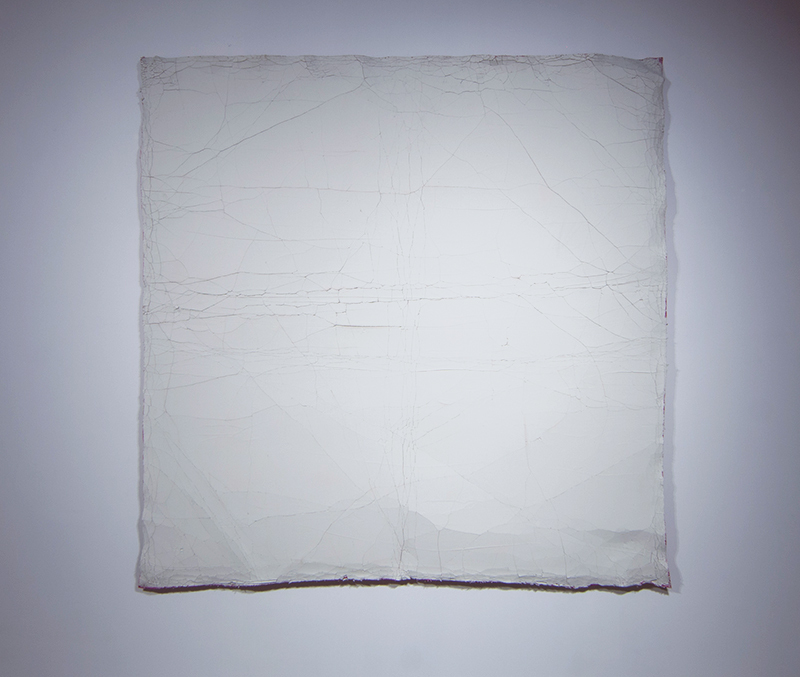 Other works, as they’re handled and repositioned over and over again, become soft and deteriorate, losing their form. Just as time is fleeting, so are the moments in Peter Manion’s art. I remember the room where it was placed. Glass table, two chairs—it sat lower than it should have been. It stood in front of a window that looked onto the yard and the brown graveled street. I sat there for many hours—after school, on weekend mornings, and late afternoons. Alone. My mother bought me a chessboard that I could play without an actual human; it was all computerized. She didn’t want me to go outside to play with other kids because she said it was “Hoosier.” My mother wanted my pursuits to be more intellectual. That was never my strong suit, but I did fall in love with playing chess. The time alone, without really understanding it, made me more connected to myself. I daydreamed as I played. I imagined the pieces and the game as a battle being waged and that there were life and death consequences for the pawn that was captured. I tried and tried to beat the computer. Level one was easy enough; two and three were breakthroughs; four was my threshold. Patience was my weapon. As I reflect on it now, I believe that my early relationship with chess led me directly to this exhibition. It wasn’t the winning or losing, the pieces and rules—it was the way it changed my way of thinking. I was purposeful and dedicated, experimental and stubborn, and flexible and determined. All of these attributes have precipitated the work I have made. It’s work that is all of those things—and sometimes it feels like I’m playing chess with these works. As fleeting as the feeling of winning or losing is, so is the way of these works. They are one thing at one moment—with beauty and purpose—and in the next moment, they are nothing and just a thing. But you push forward. You try to win again. To find the right combinations of moves—and that perfect moment. What I know is that those early years in particular changed me and playing chess alone was a formative experience. Some might say that seems sad, but during my childhood it was at times the only place I found peace and solace. Saint Louis-based artist Peter Manion received his Bachelor of Fine Arts from the School of the Art Institute of Chicago. Manion’s works hint at his background in drawing, and his emphatic strokes and subject matter offset a playful use of material, style, and sense of humor. Manion’s use of non-traditional methods, materials, and practices gives his work an animative quality, lending variance and movement to what once was undisturbed, bringing the work closer to the idea of a living object. 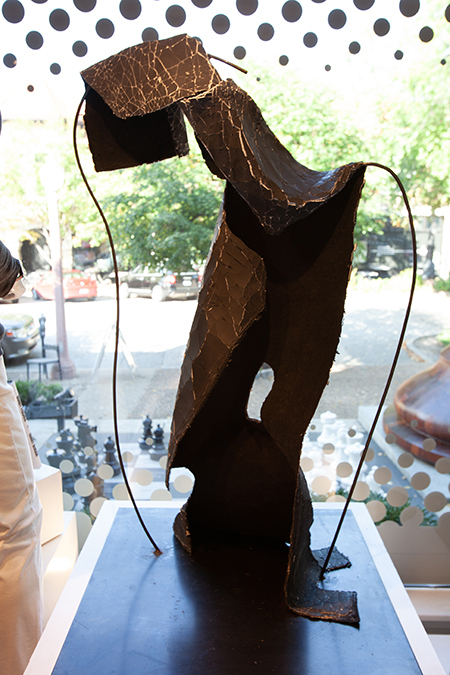 Manion has been the recipient of multiple awards, including an Award of Excellence at Art Saint Louis and the Judge’s Award of Merit at Kranzberg Arts Center, in addition to several recent exhibitions: La Fragua to Vermont: Works on Paper at Houska Gallery, Saint Louis; Imagery of Chess: Saint Louis Artists at the World Chess Hall of Fame, Saint Louis; and En La Noche, El Convento de Santa Clara de la Columna del Siglo XV, Belalcazar, Spain. Jessica Mannisi is an independent curator, curatorial consultant, and art historian with over 10 years of experience in the museum and gallery field. Working closely with regional, national, and international artists, she’s been involved in a number of award-winning exhibitions and projects. She is the art director of Houska Gallery in the Central West End, co-founder and curator of the pop-up South City studio gallery Macklind Appliance, and the assistant curator of visual art at Angad Arts Hotel in Grand Center. Mannisi is active in supporting Saint Louis-regional arts, working with several award-winning artists to elevate the local arts community. Mannisi worked as an advisor with Peter Manion on this exhibition. Financial assistance has been provided by the Missouri Arts Council, a state agency.